Since the very first disc drive, the 5MB IBM 350, storage has only become cheaper, smaller, and more plentiful. Today at CES, Kingston Digital announced the DataTraveler Ultimate Generation Terabyte (that's a mouthful) flash drives, which will be sold in both 1TB and 2TB configurations. The drives themselves are just 2.83 inches wide (72mm), and claim to support full USB 3.1 Gen 1 (otherwise known as USB 3.0) speeds; although I doubt this flash drive can max out at 5GBp/s. I would have liked to see both USB Type-A and Type-C connectors, like this Lexar drive, for easier connectivity with USB Type-C Android devices (and new Apple computers). Both drives will ship in February, but Kingston did not mention a price - no doubt they will be extremely expensive. If you buy one, please backup your data - 1/2TB of anything is a lot to lose. LAS VEGAS & FOUNTAIN VALLEY, Calif.--(BUSINESS WIRE)--2017 International CES – Kingston Digital, Inc., the Flash memory affiliate of Kingston Technology Company, Inc., the independent world leader in memory products, today announced DataTraveler® Ultimate Generation Terabyte (GT), the world’s highest capacity USB Flash drive. 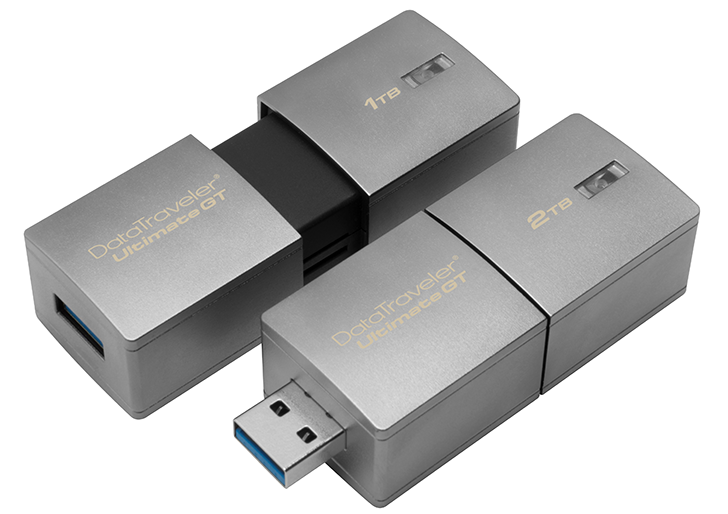 DataTraveler Ultimate GT offers up to 2TB of storage space and USB 3.1 Gen 1 (USB 3.0) performance. Power users will have the ability to store massive amounts of data in a small form factor, including up to 70 hours of 4K video on a single 2TB drive*. DataTraveler Ultimate GT offers superior quality in a high-end design as it is made of a zinc-alloy metal casing for shock resistance. Its compact size gives the tech enthusiast or professional user an easily portable solution to store and transfer their high capacity files. For more information please see below or refer to the following reference table for storage capacities. DataTraveler Ultimate GT ships in February and will be available in 1TB and 2TB capacities. It is backed by 5-year warranty, free technical support and legendary Kingston reliability. For more information, visit www.kingston.com. 1Some of the listed capacity on a Flash storage device is used for formatting and other functions and thus is not available for data storage. As such, the actual available capacity for data storage is less than what is listed on the products. For more information, go to Kingston's Flash Guide at kingston.com/flash_memory_guide. 2Speed may vary due to host hardware, software and usage. 3USB 3.1 Gen 1 performance requires a host device with a USB 3.0 or 3.1 port. Kingston Digital, Inc. (“KDI”) is the Flash memory affiliate of Kingston Technology Company, Inc., the world’s largest independent manufacturer of memory products. Established in 2008, KDI is headquartered in Fountain Valley, California, USA. For more information, please visit www.kingston.com or call 800-337-8410. Editor’s Note: For additional information, evaluation units or executive interviews, please contact David Leong, Kingston Digital, Inc. 17600 Newhope Street, Fountain Valley, CA USA 92708, 714-438-1817 (Voice). Press images can be found in Kingston’s press room here.